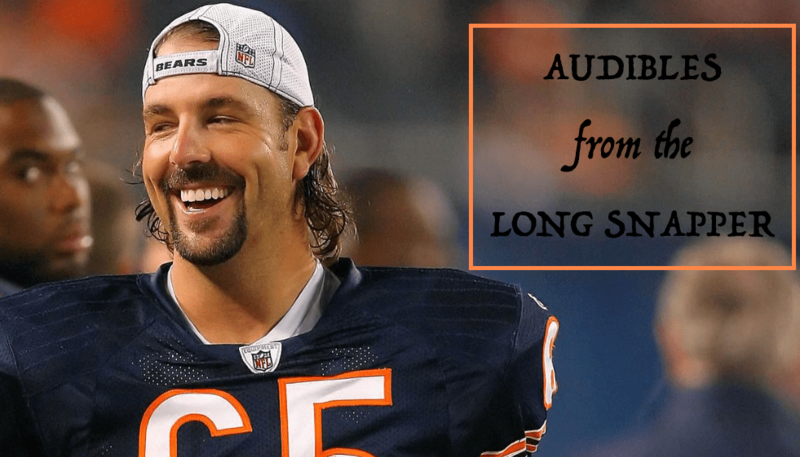 Da Bears Blog | Audibles From the Long Snapper: Massie Extends, McCaskey Speaks, Jahns Writes & Bear Movies! Bears under contract through at least 2021: Khalil Mack, Kyle Fuller, Roquan Smith, Akiem Hicks, Mitch Trubisky, Eddie Goldman, Bobby Massie, Charles Leno, Jr., Trey Burton, Kyle Long, James Daniels, Anthony Miller, Taylor Gabriel. Excellent nucleus. My guess on this signing: it’s just for show. I believe the Bears are still going to be players on the free agent market, namely pursuing Robbie Gould if he’s not franchised in San Francisco. And they will certainly be bringing in bodies post-draft. One thing is certain: Cody Parkey is never putting on a Bears jersey again. Still, McCaskey wouldn’t dismiss the possibility of the Bears signing Hunt, though he said the team was nowhere near making any such decision. He said coach Matt Nagy and general manager Ryan Pace haven’t discussed the running back with him, though both publicly declined to rule out signing Hunt earlier this month. Nagy said he called Hunt to check in on the player he coached with the Chiefs last year, which McCaskey said was proof that Nagy cared about players beyond the field. Four years after McDonald, McCaskey said he would weigh in on Hunt if it were warranted. Any decision, McCaskey said, seems far in the future. It was another fun moment in Florida for Trubisky, Cohen and Jackson, the Bears’ three Pro Bowl players from their once-ridiculed 2017 draft class. It’s funny to look back at the criticism, too. The worst came in an article from CBS insider Jason LaCanfora on April 30. “Either the Bears know something no one else in the league knows, or that draft just got a lot of people fired, only they don’t know it yet,” another anonymous executive said in the article. That’s fine. As if the Bears cared. The Bears loved what they did, starting with their trade for Trubisky. The Browns, Jets and Bills didn’t get him. That’s all that mattered. “When you’re that far into it and you’re this close to getting the guy you want, there was zero chance we were taking any kind of chance,” said Lucas, who played an integral role in scouting Trubisky. And the Bears nearly hit on all of them. Ryan Pace is good at drafting. I asked Noah for advice on what to write last Friday. He suggested this. It’s ridiculous. So I’m doing it and throwing it at the end of Audibles. (5) The Great Outdoors (1988). One great scene is all that’s required for this underrated John Candy/Dan Aykroyd picture to make the list. I’m not even sure the scene is still funny but it was when I was 6. So I’m putting it on the list. (4) The Muppet Movie (1979). It’s Fozzie’s best performance in a Muppet film. (3) Grizzly Man (2005). If you haven’t seen Werner Herzog’s brilliant documentary, just see it. You’ll understand why the many bears – especially one – are ranked this high. (1) The Edge (1997). The bear is literally the third lead behind Alec Baldwin and Anthony Hopkins. For more cutting edge movie analysis, be sure to follow @HughesReviews – my movie identity – on Twitter.